Description: Texas. German derivation of the Arrowsmith map showing the Texas Republic to its fullest extent. 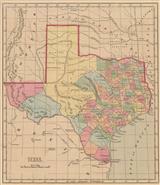 Description: Colourful map of the Republic of Texas, just before it joined the Union in February 1846. Original colour. 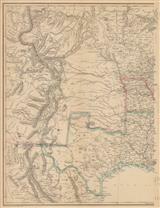 Description: German map showing Texas just after the formal accession from Republic to State in February 1846. Original colour. Description: State map. Original colour. Description: Texas and Indian Territory. Original colour. Description: Texas, Colorado, Utah and Nebraska. Original colour. 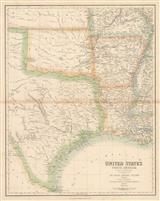 Description: Splendid map of Texas published just after the end of the Civil War and at the dawn of the Cowboy Age. Printed colour. Cartographer: H.H. Lloyd & Co. Description: The state of Texas divided into its counties. A proposed Pacific Railroad route is marked, as are a wagon trail and U.S. mail route to California. Original hand-colour. 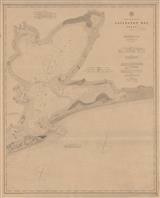 Description: Two charts of Galveston Port and Bay, once the Capital of the Republic of Texas. Printed colour. 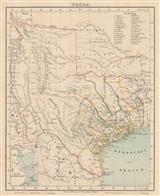 Description: 10 maps on one sheet, the main of which details the coast of Texas and its defences during the Civil War. Printed colour. Description: Very detailed survey of the region around Crockett, Athens, Palestine and Marshall in South Texas. Printed colour. 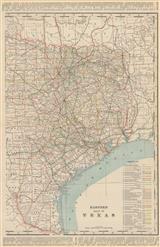 Description: Large railway map of Eastern Texas, with reference panels on outer edges and colour key by title. Printed colour.